Spears makes the highest quality check valves. Use them to add a last line of defense against overflows. Check valves allow one directional water flow and are used to prevent back siphoning. 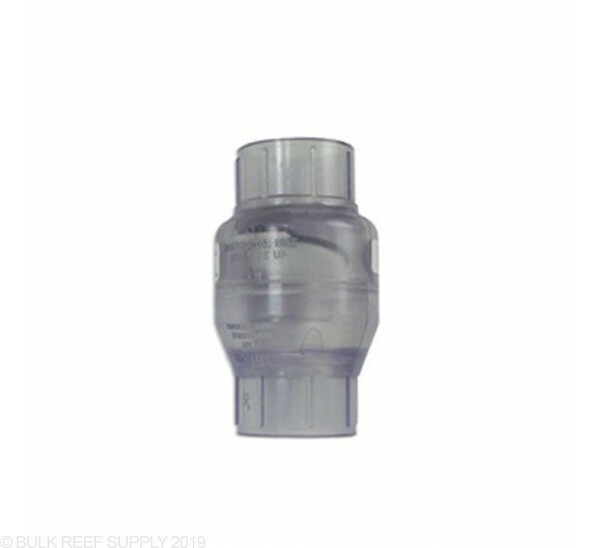 They are commonly used on return pump outputs to prevent water overflowing the sump in the event of a power outage, pump failure or maintenance. When in doubt order extra. We happily accept returns for a full refund (less shipping) on all unused fittings within one month of purchase. A few extra bucks in return shipping is less frustrating then a project delay. Installed this Spears union check valve on my return line to my tank. Despite the other glowing reviews, this check valve failed after 1.5 months. It now produces a large hammering noise as the water flows back down into my tank when the return pump is off. Nothing was blocking the valve and nothing was growing within the valve chamber. I took apart the plumbing to clean out the valve. After one day, the hammering noise began again. Extremely disappointed! Twasn't the night before Christmas, so I bought for myself, a clear one-way valve to prevent power-failure hell-f. It works like a charm, and nothing bad can I say, so everyone buy one and have a nice day. I got tired of the submersible pump in my sump and decided to put a Reeflo Snapper on my 55 gallon. I used the Spears 2" check valve on the output side of the new pump and then above the Spears, there' s a 2 inch ball valve (Lowe's) to adjust the flow. Works great so far! 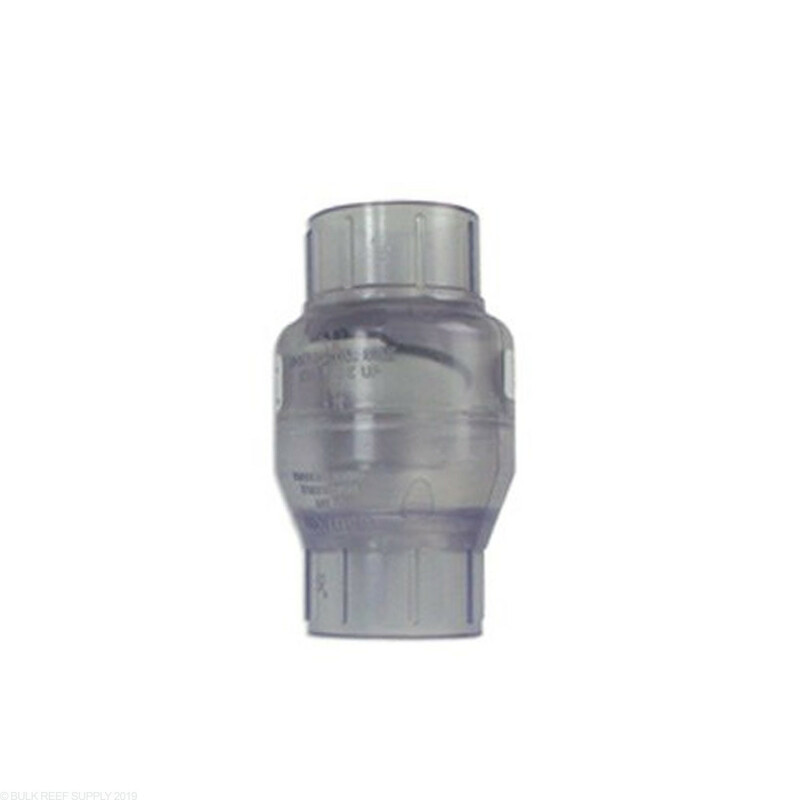 I recently ordered the 3/4 inch Spears Schedule 80 Check Valve. Sand off the sawed PVC parts ( I could not find 3/4 inch coupler so thats what I had to do. Is this check valve threaded at bothe ends? This fitting is a slip fitting, it has no threads. Does this check valve disassemble for cleaning? The Spears swing check valves are not serviceable. You could always clean them with vinegar, but the actual seal cannot be removed from the valve, like the George Fischer Wye check valve can. Are these threaded or slip? All of the fittings are slip (as this is "normal") unless specifically labeled as thread. In the case of these valves they are all slip. Can this be used with vinyl tubing and a clamp? Or just PVC? This fitting only has slip fittings (for PVC pipe) but you could glue on a set of barb fittings if you wanted to use it with vinyl tubing and a clamp. Are these listed as the internal or outside dimentions? PVC fittings are sized in a "nominal" sizing. Neither dimension will read exactly the same but the nominal size means that a 1" check valve is going to fit a 1" pvc pipe, which will fit a 1" elbow, etc. The standard is the same across all the PVC as well so a 1" sch80 check valve will fit a 1" sch40 pipe and so on.